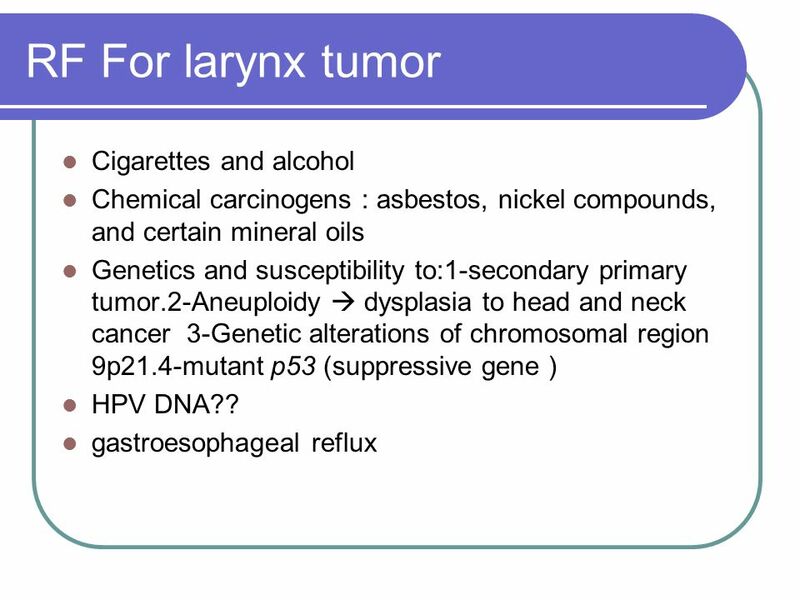 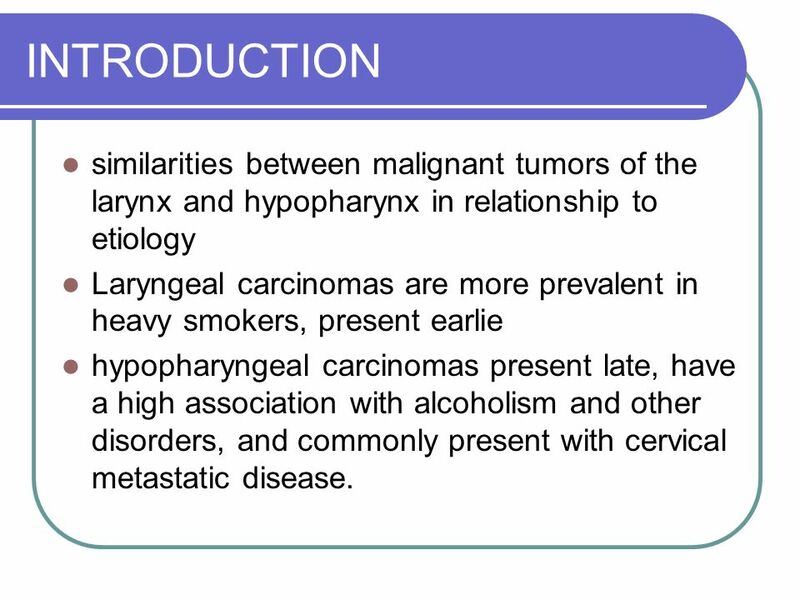 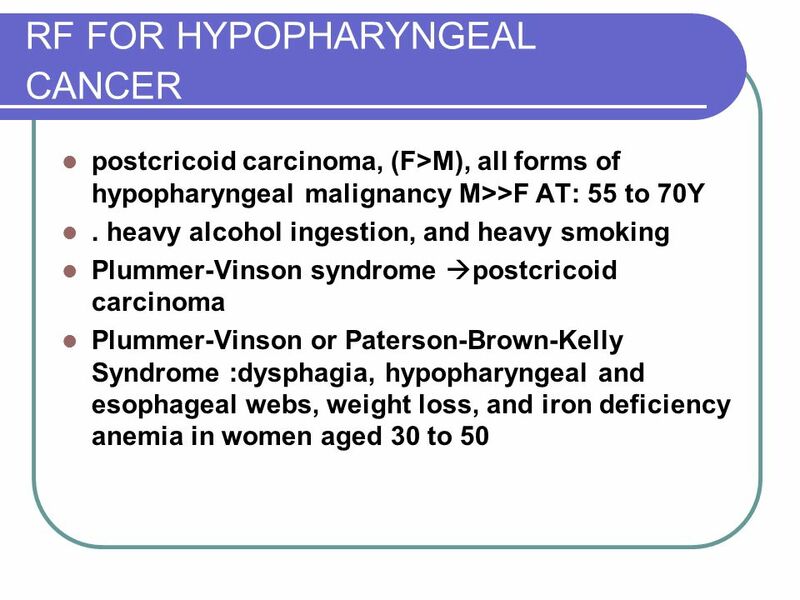 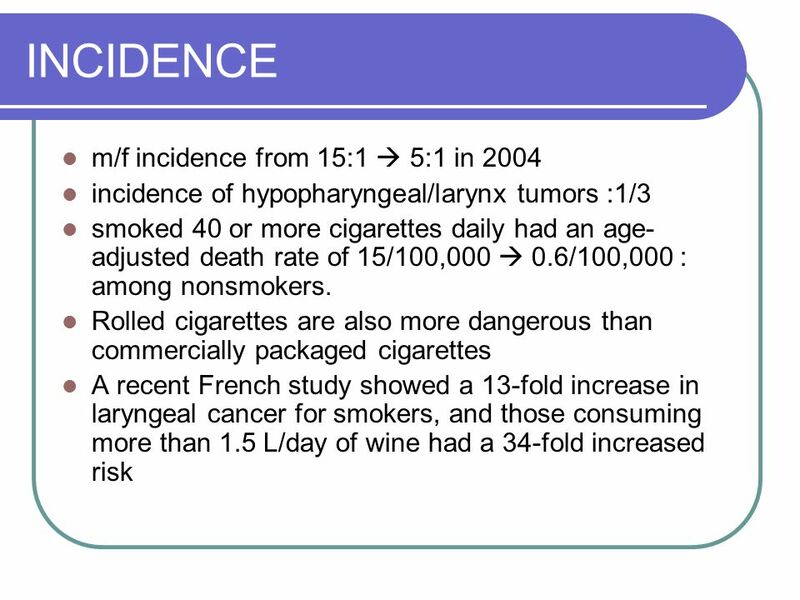 3 INTRODUCTION similarities between malignant tumors of the larynx and hypopharynx in relationship to etiology Laryngeal carcinomas are more prevalent in heavy smokers, present earlie hypopharyngeal carcinomas present late, have a high association with alcoholism and other disorders, and commonly present with cervical metastatic disease. 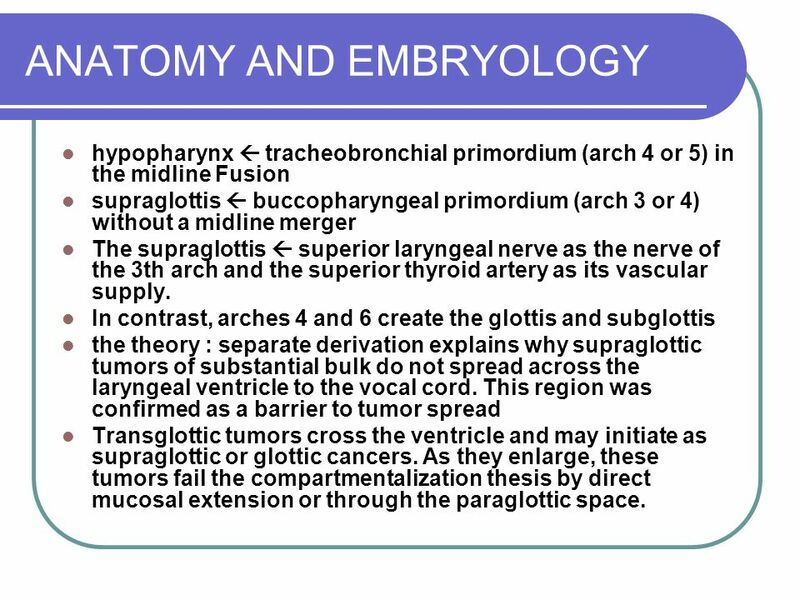 hypopharynx  tracheobronchial primordium (arch 4 or 5) in the midline Fusion supraglottis  buccopharyngeal primordium (arch 3 or 4) without a midline merger The supraglottis  superior laryngeal nerve as the nerve of the 3th arch and the superior thyroid artery as its vascular supply. 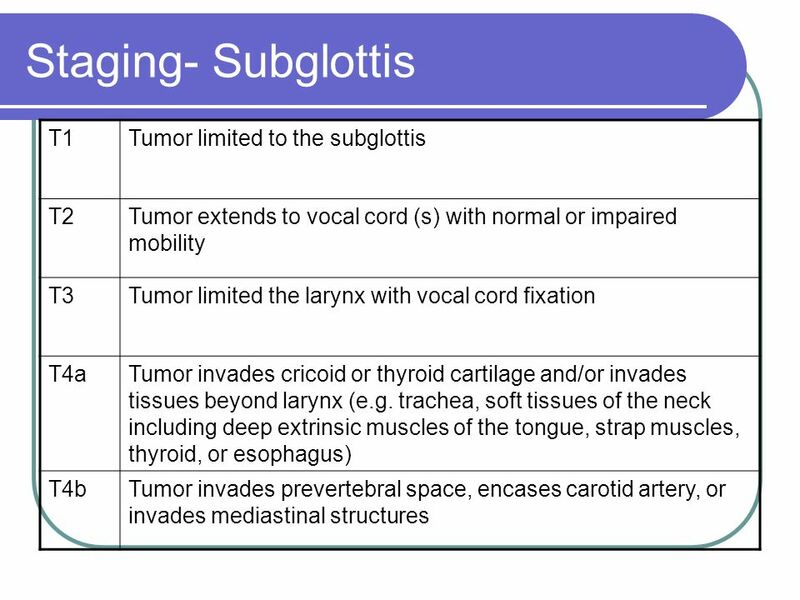 In contrast, arches 4 and 6 create the glottis and subglottis the theory : separate derivation explains why supraglottic tumors of substantial bulk do not spread across the laryngeal ventricle to the vocal cord. 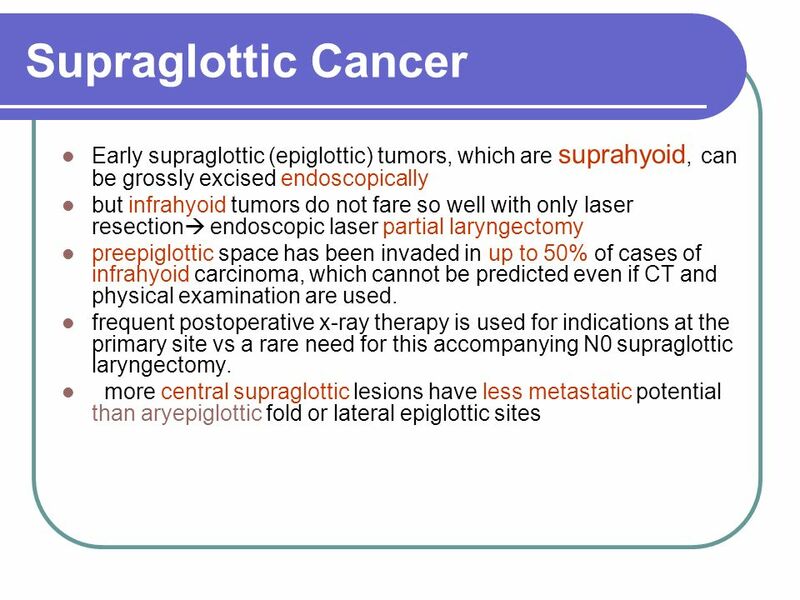 This region was confirmed as a barrier to tumor spread Transglottic tumors cross the ventricle and may initiate as supraglottic or glottic cancers. 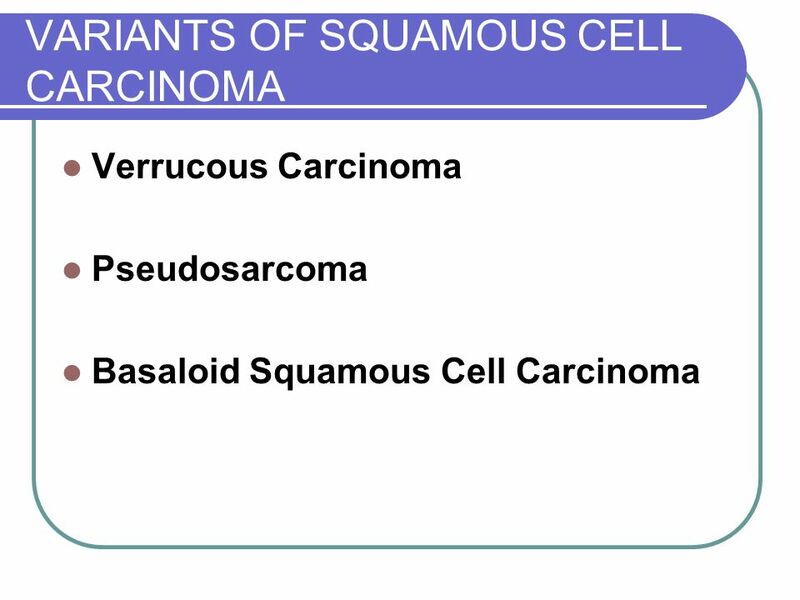 As they enlarge, these tumors fail the compartmentalization thesis by direct mucosal extension or through the paraglottic space. 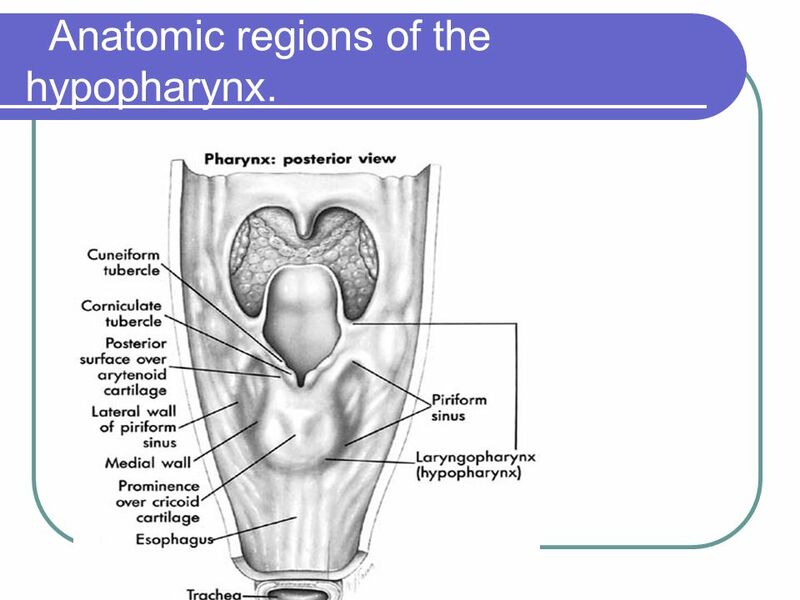 11 Anatomic regions of the hypopharynx. 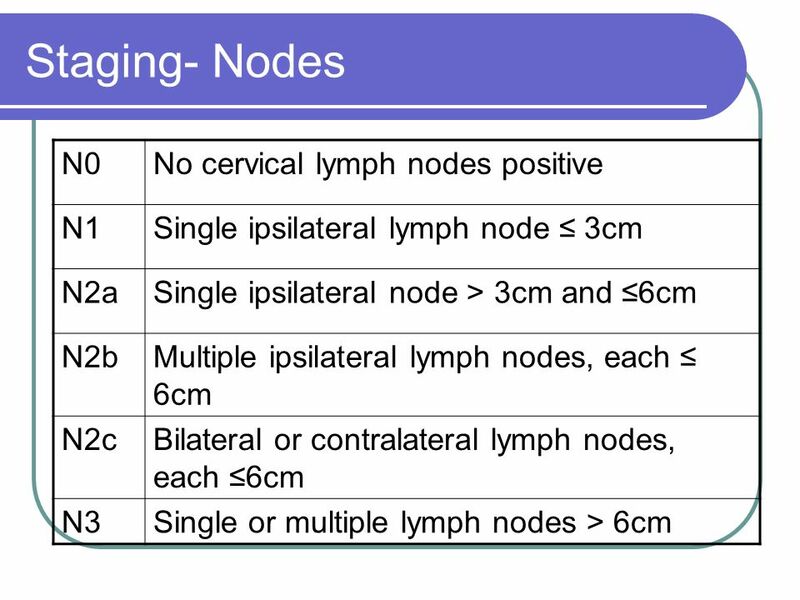 for T1 lesions, surgery 90% to 95% cure rates --_>radiotherapy(cure rates of 75% to 90%.) 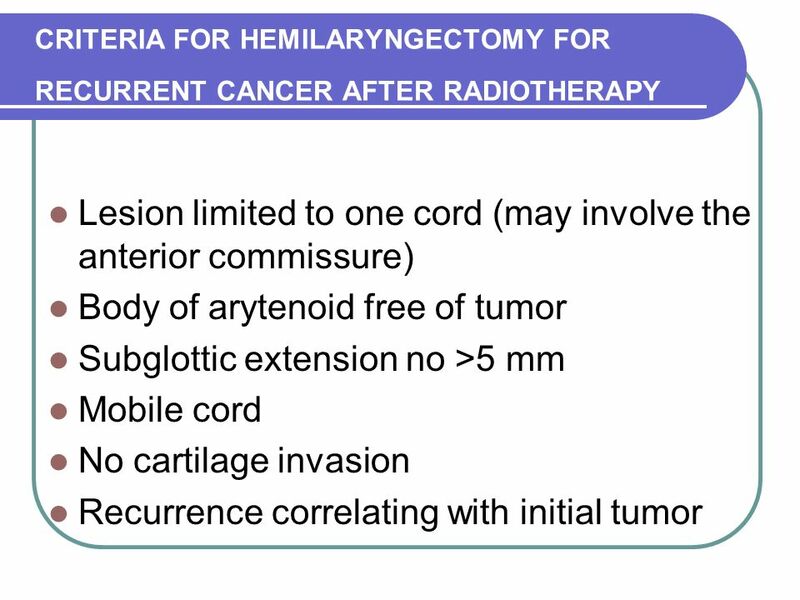 Partial surgery(no radiotherapy): 1)decreasing importance vocal cord mobility, 2) subglottic extension, 3) anterior commissure invasion, 4) arytenoid cartilage involvement. 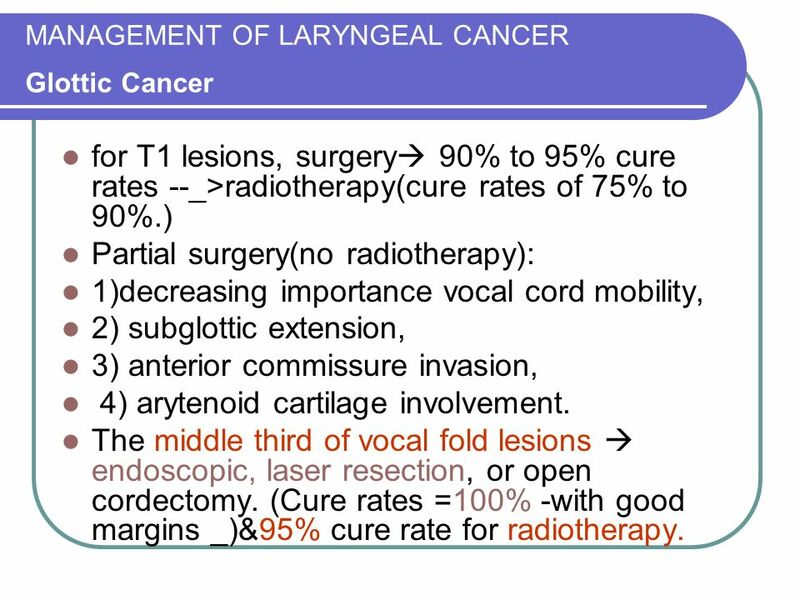 The middle third of vocal fold lesions  endoscopic, laser resection, or open cordectomy. 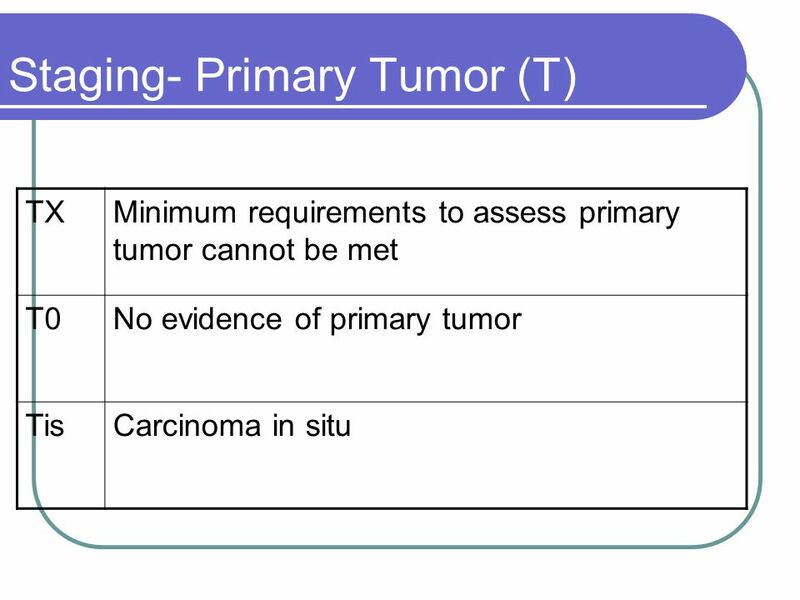 (Cure rates =100% -with good margins _)&95% cure rate for radiotherapy. 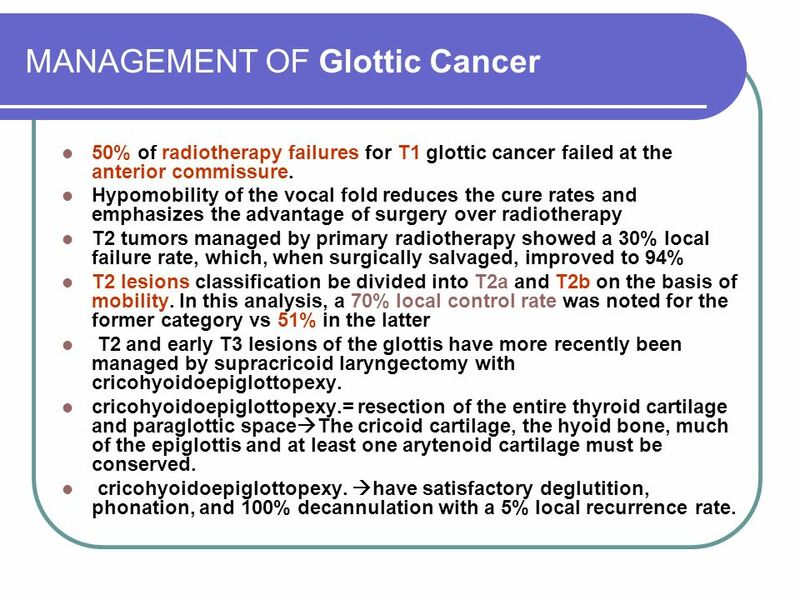 50% of radiotherapy failures for T1 glottic cancer failed at the anterior commissure. 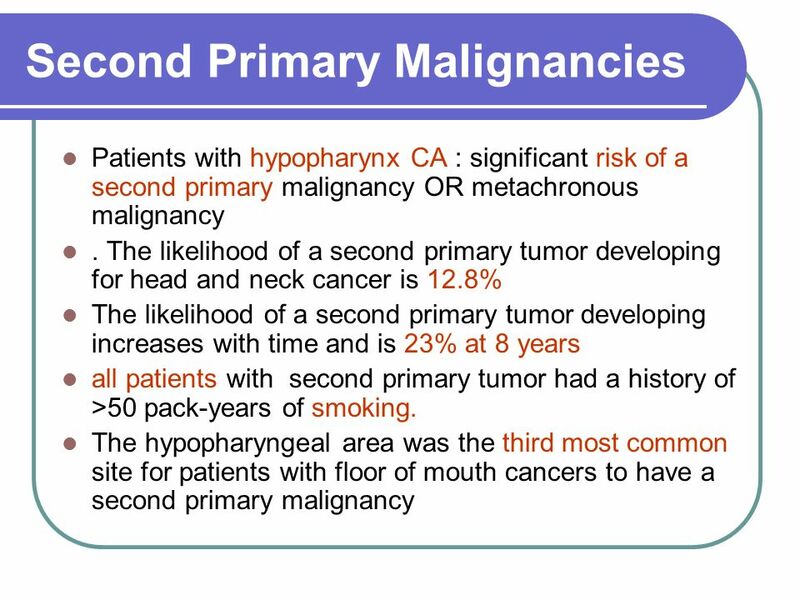 Hypomobility of the vocal fold reduces the cure rates and emphasizes the advantage of surgery over radiotherapy T2 tumors managed by primary radiotherapy showed a 30% local failure rate, which, when surgically salvaged, improved to 94% T2 lesions classification be divided into T2a and T2b on the basis of mobility. 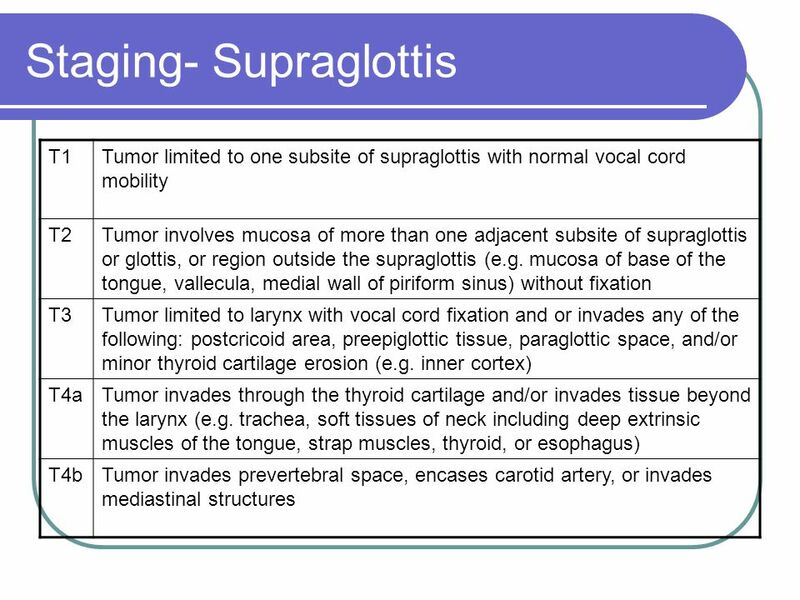 In this analysis, a 70% local control rate was noted for the former category vs 51% in the latter T2 and early T3 lesions of the glottis have more recently been managed by supracricoid laryngectomy with cricohyoidoepiglottopexy. 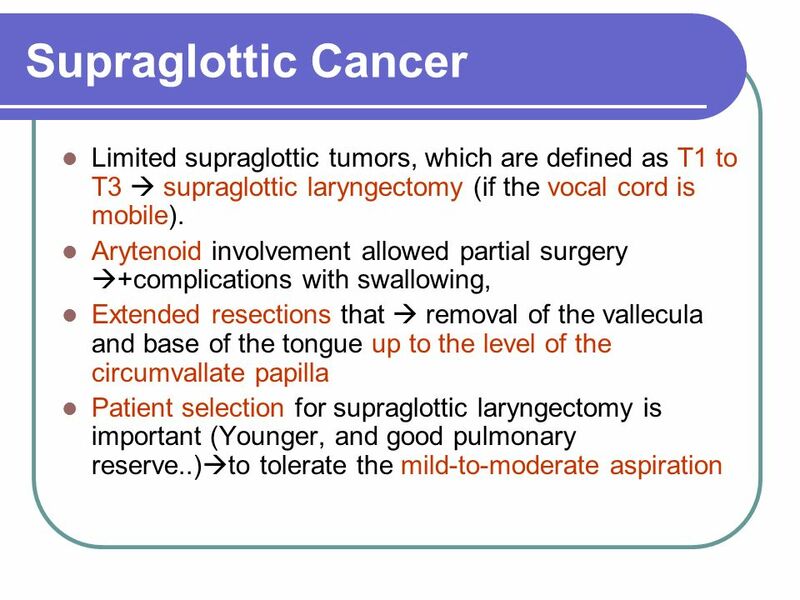 cricohyoidoepiglottopexy.= resection of the entire thyroid cartilage and paraglottic spaceThe cricoid cartilage, the hyoid bone, much of the epiglottis and at least one arytenoid cartilage must be conserved. 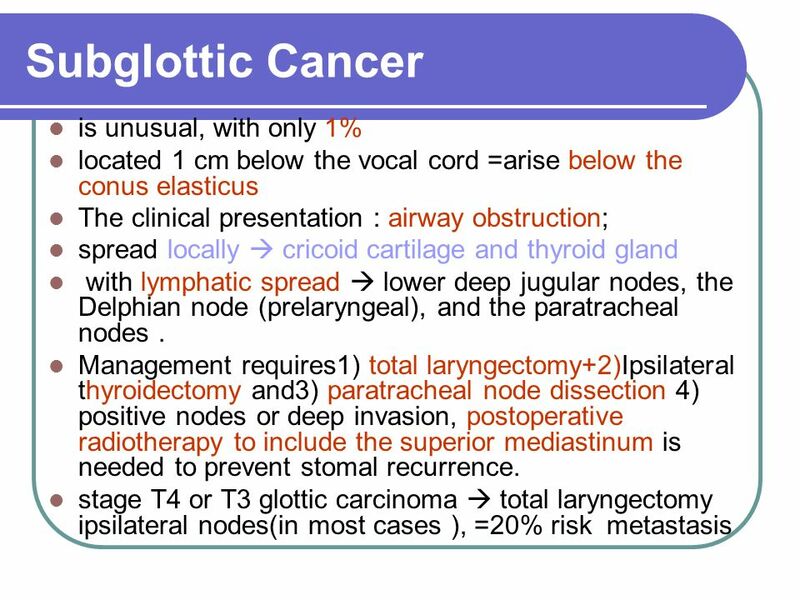 cricohyoidoepiglottopexy. 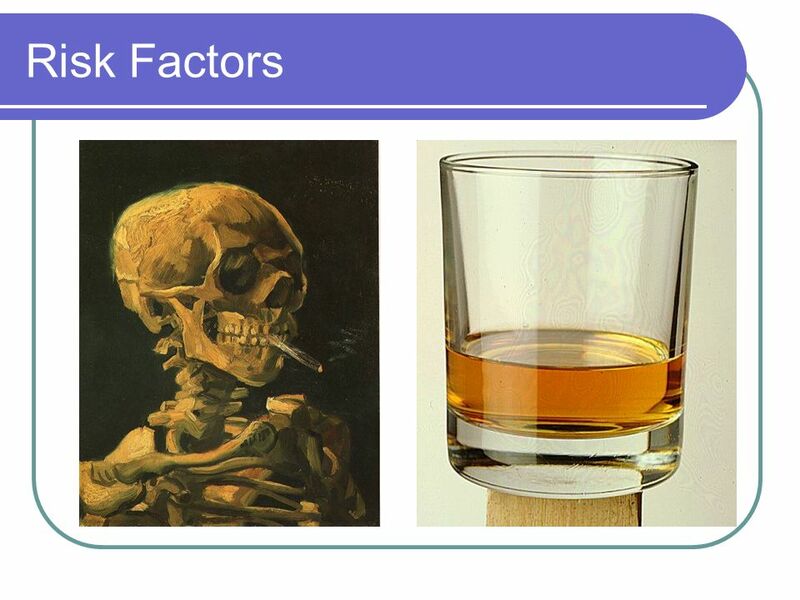 have satisfactory deglutition, phonation, and 100% decannulation with a 5% local recurrence rate. 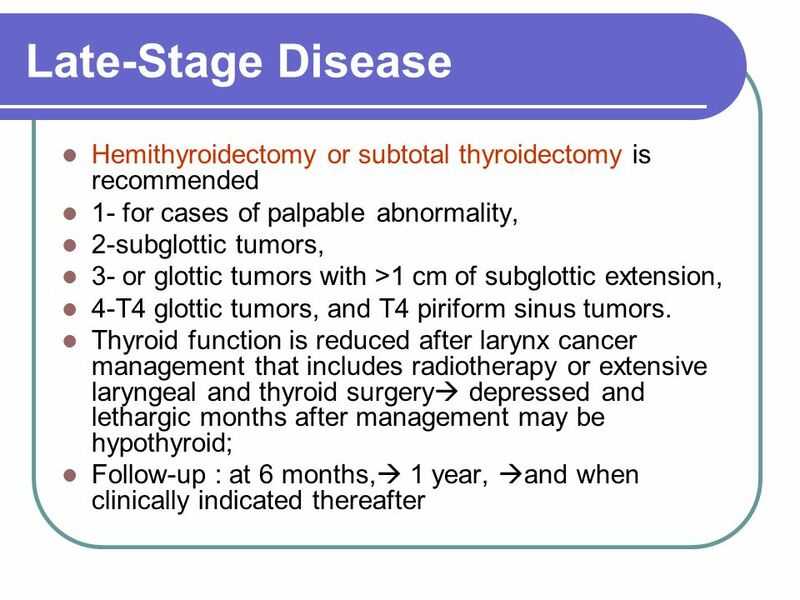 28 Late-Stage Disease Obstructive laryngeal  premanagement tracheostomy increased local or stomal recurrence If a tracheostomy is necessary,  surgery within 48 hours+bilateral paratracheal node dissection+ postoperative mantle radiotherapy. 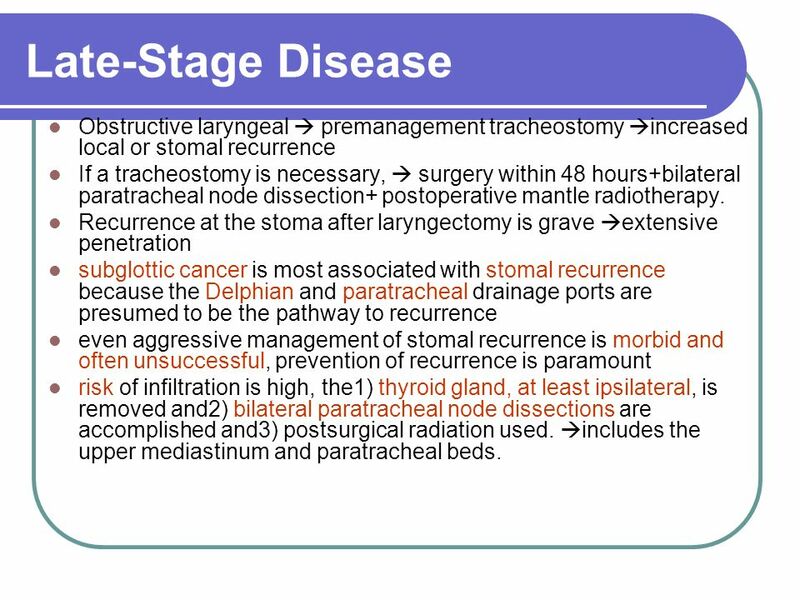 Recurrence at the stoma after laryngectomy is grave extensive penetration subglottic cancer is most associated with stomal recurrence because the Delphian and paratracheal drainage ports are presumed to be the pathway to recurrence even aggressive management of stomal recurrence is morbid and often unsuccessful, prevention of recurrence is paramount risk of infiltration is high, the1) thyroid gland, at least ipsilateral, is removed and2) bilateral paratracheal node dissections are accomplished and3) postsurgical radiation used. 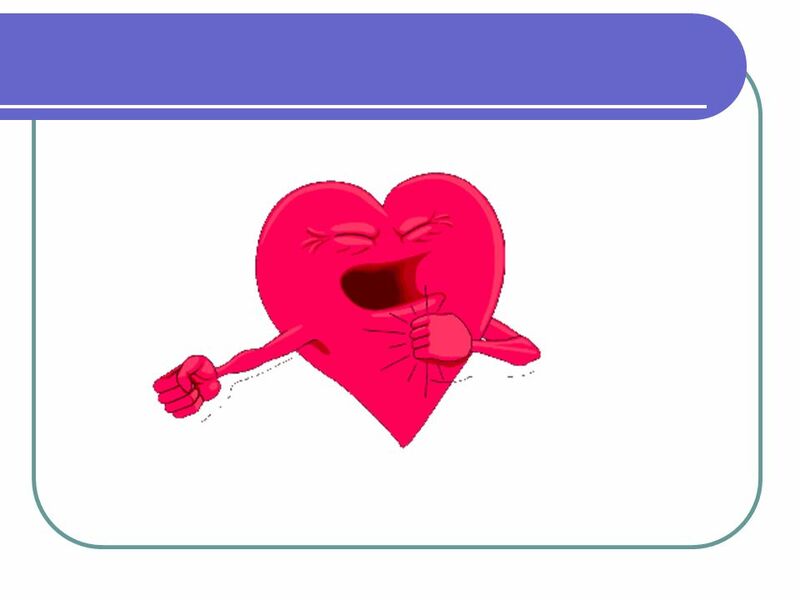 includes the upper mediastinum and paratracheal beds. 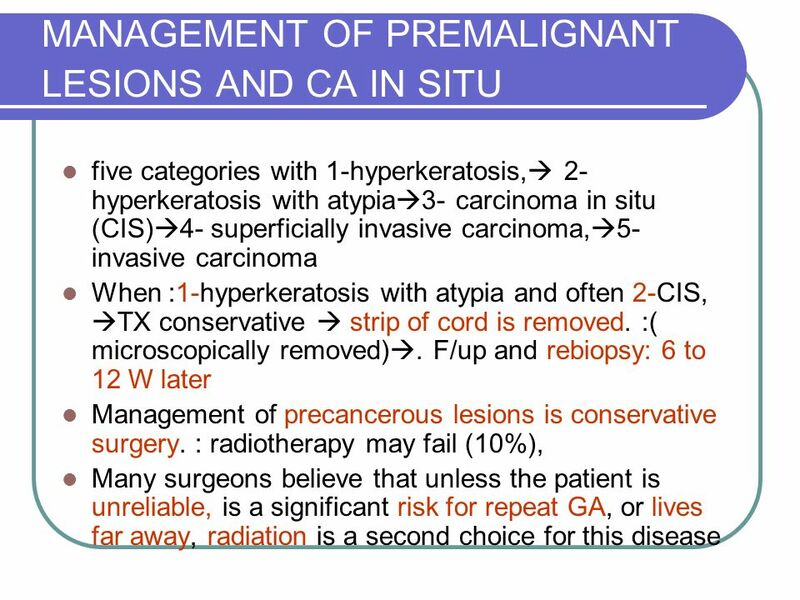 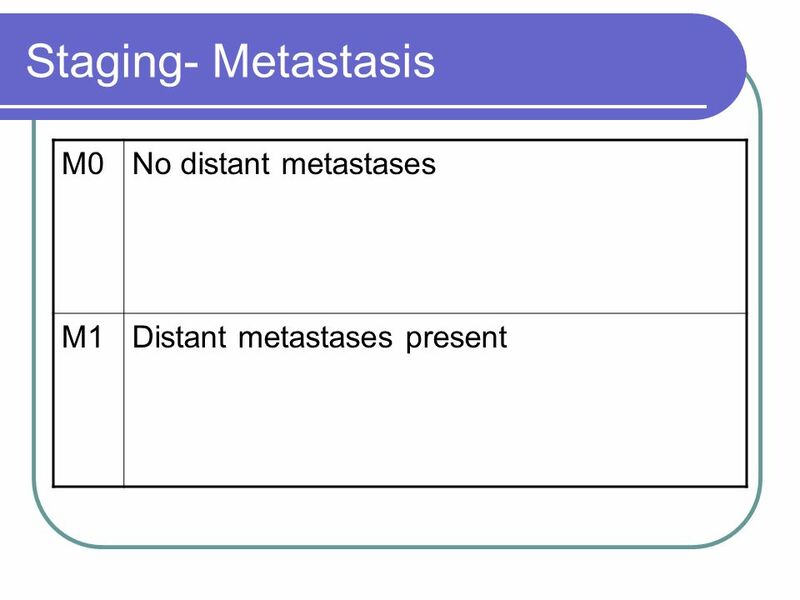 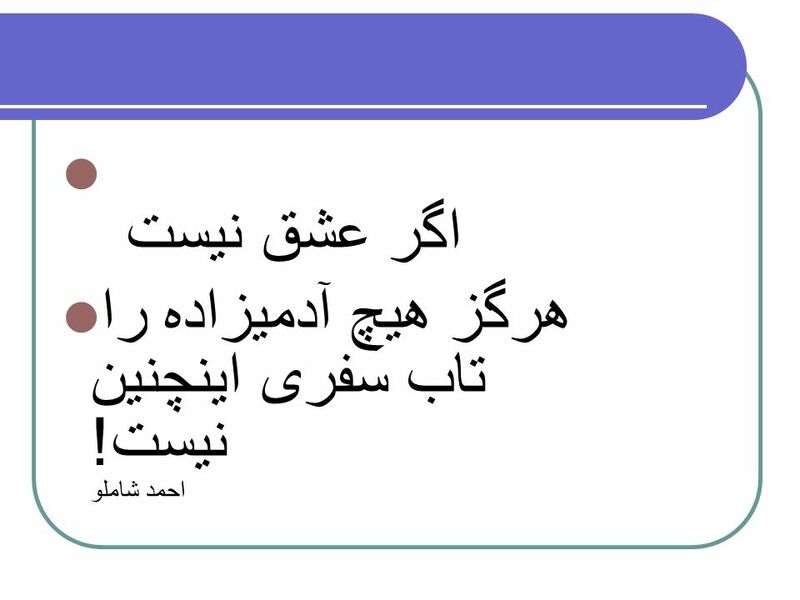 Download ppt "اول دفتر به نام ایزد یکتا ...."
Pimp Session: Breast By James Lee, MD. 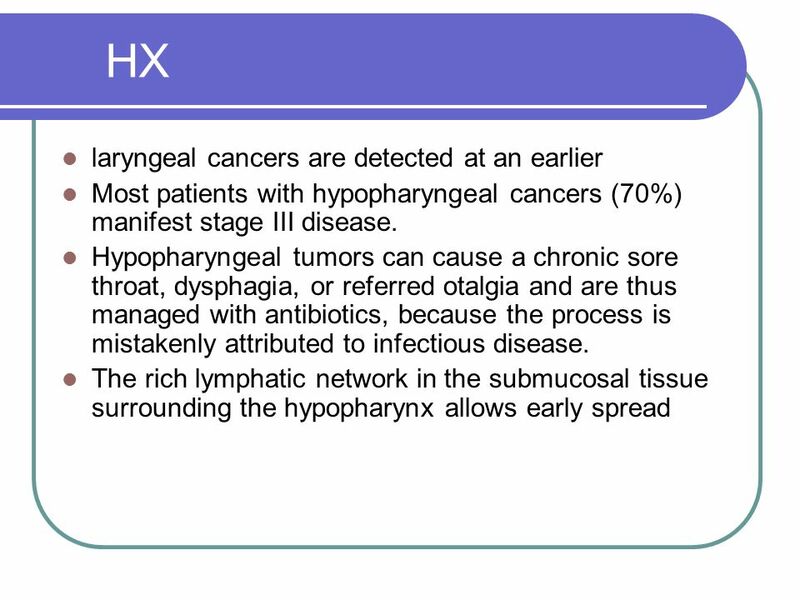 Adult Neck Masses Justin Dumouchel 9/14/05. 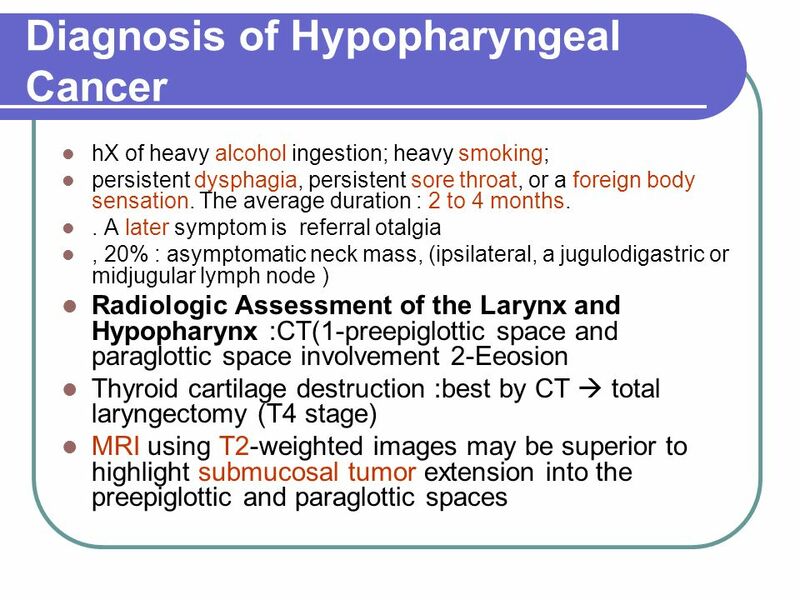 It is the most common cancer of the upper aerodigestive tract. 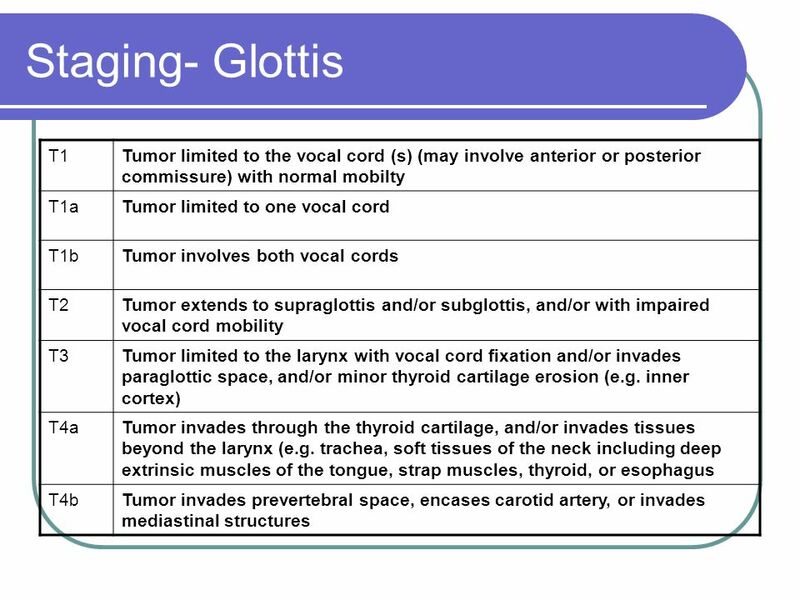 Section 3: Lecture 1; Anatomy & physiology of voice production. 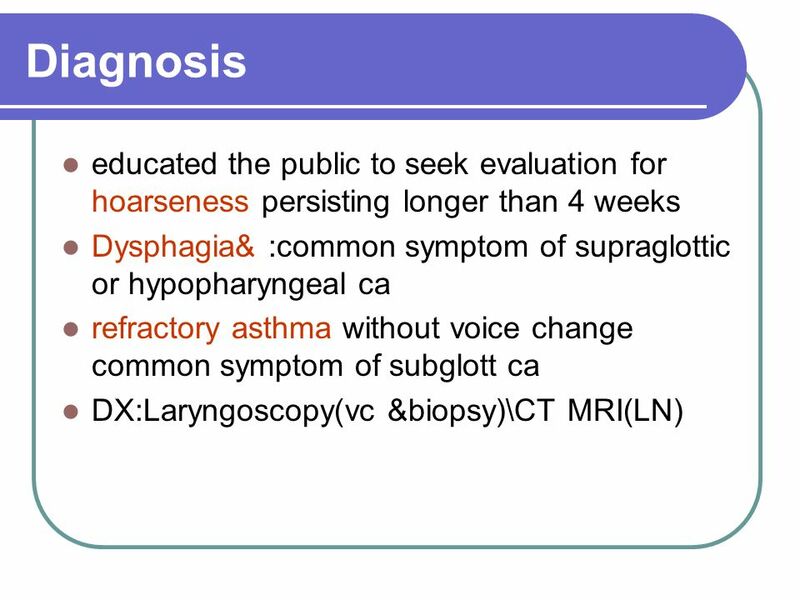 “Pharyngocutaneous Fistulas after Salvage Laryngectomy: Need for Vascularized Tissue” Wojciech K. Mydlarz, M.D. 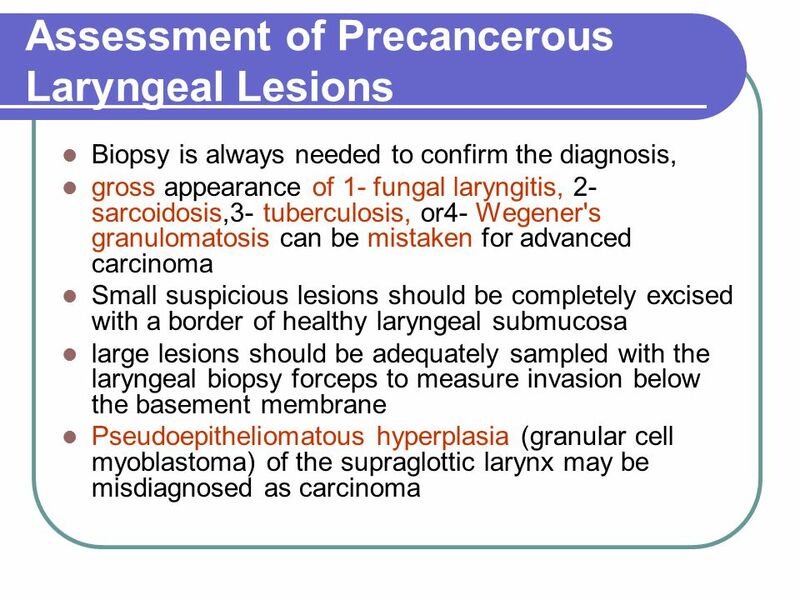 Laryngeal Malignancy Dr. Vishal Sharma. 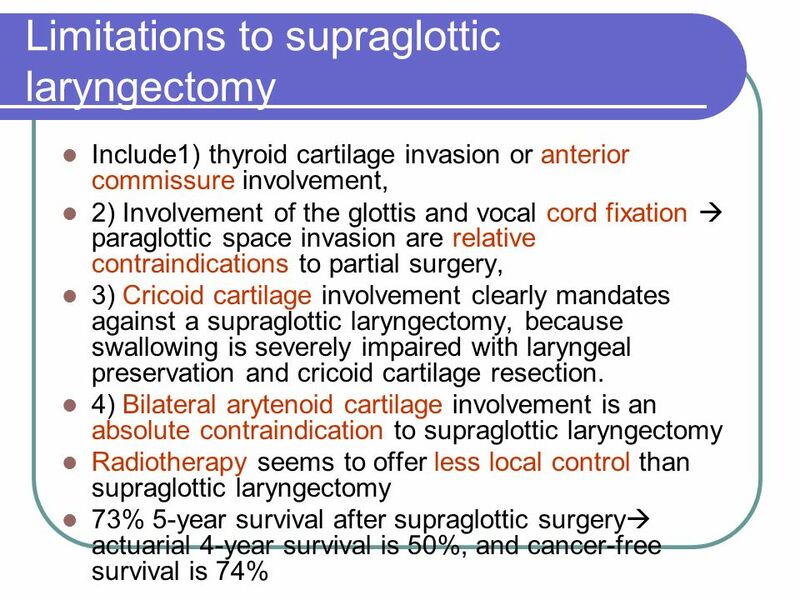 Conservation laryngeal surgery. 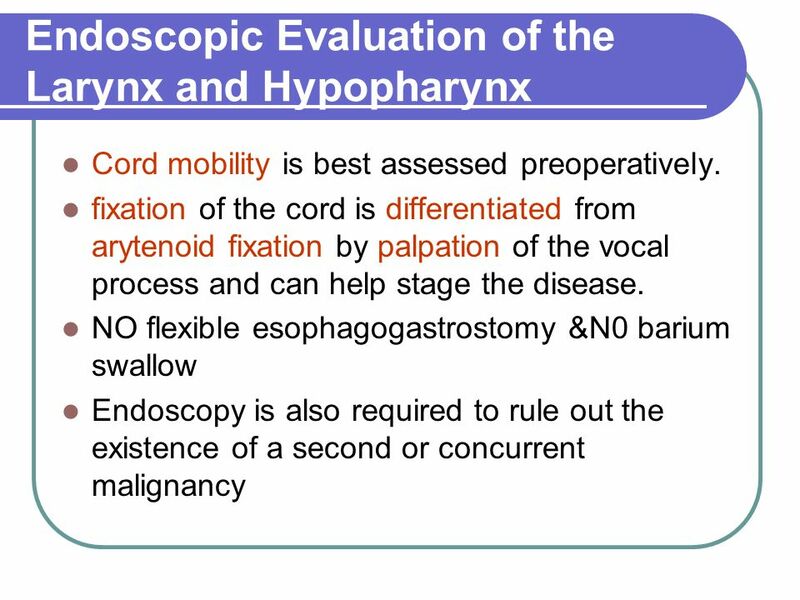 Reference Cummings otolaryngology head and neck surgery, 5 th edition, chapter 110 ; conservation laryngeal surgery P.
The Larynx The larynx is the portion of the respiratory tract containing the vocal cords A 2-inch-long, tube-shaped organ, opens into the laryngeal part. 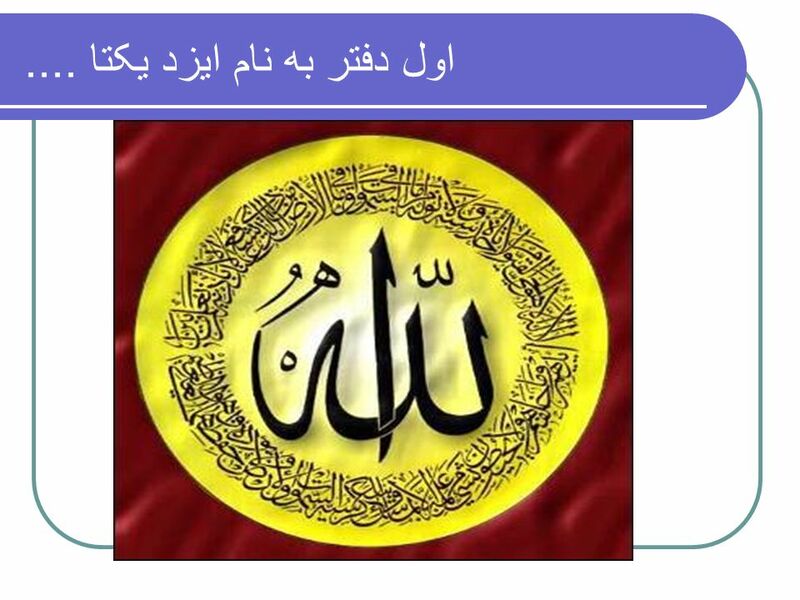 In the name of God. 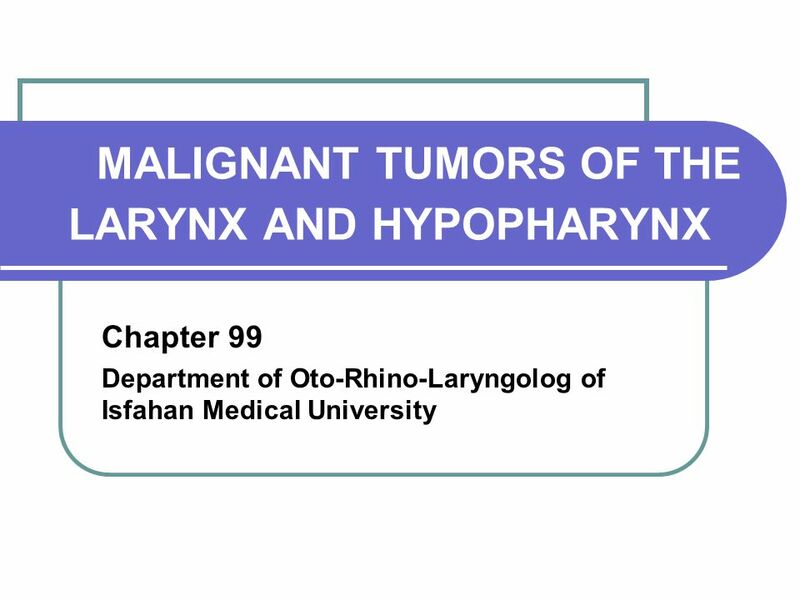 Laryngeal Carcinoma M. H. Baradaranfar M.D professor of otolaryngology Head and Neck surgery Rhinologist.